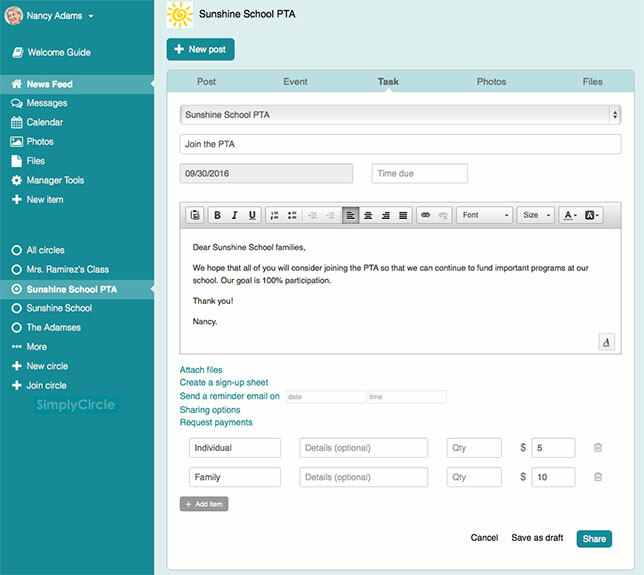 A web-based communication service for people in a school community has added a feature that allows for online payments. SimplyCircle, from a company with the same name, lets teachers and parents communicate with each other for class, PTA and school activities. The new function lets "circle" managers collect payments from circle members. The company anticipates that the capability will be used to collect payments for field trips, class fund contributions, PTA dues and related activities. Once a payment "post" is created, the manager can share it on a news feed that members see and via e-mail. The feature relies on PayPal to work and charges an additional 1 percent fee on top of PayPal's own 2.9 percent plus $0.30 fee for each transaction. The advantage is that users can pay directly with a credit card, debit card or via PayPal's own payment service. The payment capability is available on the free version of the program and on subscription editions. Users of SimplyCircle have included parents at Walnut Creek Middle School in Pennsylvania, Rockledge Elementary School in Virginia and the Champion School in Georgia.